Take a tour with your Google Cardboard though the fleet of cruise ships of AIDA and book your cabin right away. Our customer AIDA captured 360 images of every cabin and public area on their ships to make them walk-able with your Google Cardboard. For the release party in Hamburg we produced the branded Cardboard for the Customer to take the 360 tour. 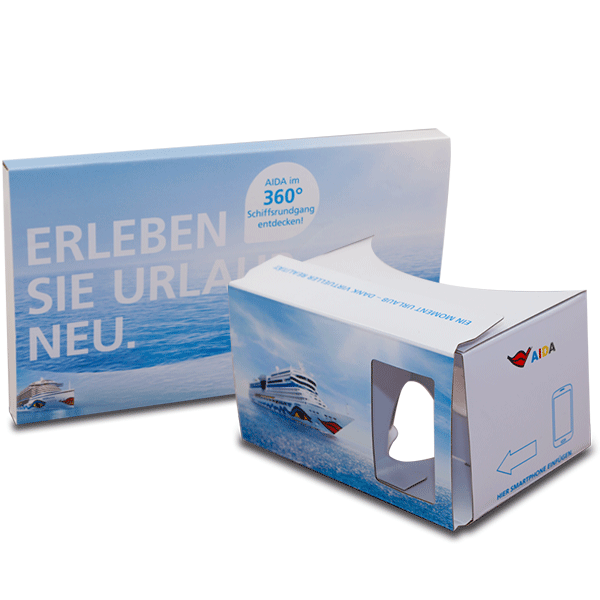 For the future those branded Cardboards will be available in the tourist agencies across Germany to promte the cruise ship right on point of sale. Interested customer will get a custom Cardboard home, to make the buy decision comfortable form their sofa at home.